Pangolins, also known as scaly ant eaters, are one of the most illegally traded species on the planet, killed for their meat and scales. Globally, there are eight species of pangolin distributed across the continents of Asia and Africa. The four found in Asia are the Indian Pangolin, Philippine pangolin, Sunda pangolin and Chinese pangolin while the African pangolin species are black-bellied pangolin, white-bellied pangolin, giant ground pangolin and Temminck’s ground pangolin. Population crashes attributed to the current poaching epidemic within Asian pangolin populations has led to significant growth in export of scales from Africa. In light of this and the continued threat posed by the illegal trade, all eight pangolin species were uplisted to Appendix I at the most recent Conference of the Parties to CITES, in South Africa in September 2016. Species on Appendix I are considered threatened with extinction and cannot be traded other than in exceptional circumstances. This uplisting reflects the wide acceptance that populations for all pangolin species are in serious decline, with the International Union for the Conservation of Nature (IUCN) listing all Asian pangolin species as either “Critically Endangered” or “Endangered” while the African species are all listed as “Vulnerable”. Hunting for trade is the primary threat to the survival of all pangolin species. Trade in the markets of East Asia and South-East Asia is mainly driven by the demand for the meat, which is expensive and consumed to demonstrate status, and the scales for use in traditional medicine. It was only in May 2015 that the Vietnam Government stopped pangolin scales being available under health insurance schemes, while China still has a domestic yearly quota of roughly 25 tonnes, equivalent to anywhere between 25,000-50,000 pangolins, of Chinese pangolin scales for medicinal use. Considering the “Critically Endangered” status of Chinese pangolins, especially within China, and the well-documented difficulties involved and rarity of successful captive breeding programmes for pangolins, this quota is almost certainly being filled by pangolins poached from the wild elsewhere. Available seizure data suggests that the scale of illegal trade has increased significantly since 2008 as a result of growing demand from consumer nations. It has been estimated that as many as one million pangolins have been illegally traded within Asia in the past 10-15 years. 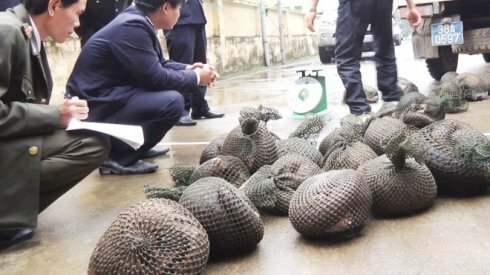 Our analysis of available crime reports suggests that 160,000 individual pangolins have been seized during the past 16 years; if contraband seized can represent as little as 10 per cent of actual illegal trade, the total number of pangolins traded could be nearer one-and-a-half million during the period. Even this figure is likely to be an underestimate. Trafficking in such large quantities occurring on an international scale highlights the organised nature of this illegal trade which is proving increasingly profitable to wildlife traffickers. This unsustainable illegal trade continues today, seemingly unabated. With the rapidly decreasing populations of Asian pangolin species due to such heavy and unsustainable hunting pressures, a significant growth in the trade of African pangolin species, especially for scales, has been observed in the past eight years. Recent seizures include six tonnes of scales destined for Asian markets seized in Tanzania in January 2017 while known seizures of pangolin scales since December 2016 total more than 14 tonnes, potentially representing more than 20,000 individual pangolins. This trend is reflected in the map below, where we have plotted the publicly available records for pangolin seizures globally. When we first published the map in February 2016, there were 39 documented seizure incidents within Africa. Following further research, the map now shows 113 reported seizure incidents, 39 of which occurred in 2016, highlighting escalation of trade in pangolin scales within Africa. This map was last updated in February 2018. Of particular concern is the size of the seized pangolin scale shipments both within Africa and key import hubs in Asia known to originate from Africa, with Tanzania, Nigeria, Cameroon and Uganda emerging as key export hubs. Since 2015, there have been 10 seizures of pangolin scales each over two tonnes representing 2,000-5,000 pangolins, six of which occurred in 2016, either within Africa or originating in Africa and seized in key Asian import. The largest of these, seized in Hong Kong originating from Nigeria, totalled over seven tonnes of pangolin scales, accounting for 7,000-14,000 pangolins and mislabelled as “recycled plastic”. From only these 10 seizures, the amount of pangolin scales seized which originated from Africa stands at over 30 tonnes, or 30,000-60,000 pangolins. The interactive map highlights the international nature of the pangolin trade; it is based on a subset of poaching and seizure incidents from 2000-17 which we compiled from publicly available records, primarily English and Chinese language sources. This map represents only a fraction of actual trade in pangolins during that time period, with the data being limited by the inherent biases generated by the types of media monitored, accurate reporting of seizures, levels of media interest in pangolins and research capacity; therefore it is not an exhaustive data set. The map does, however, highlight key border crossings, ports and countries where there has been a significant reporting of trade in pangolins over the past 16 years. Where scales have been seized, and where possible, the number of pangolins required to provide that weight in scales has been roughly estimated using a mean weight for an Asian pangolins of 5kg per adult, with the scales constituting, very roughly, 20 per cent of body weight, although this does vary between species and efforts to come up with a more accurate average figure are ongoing. Where no specific location was given, a data point has been placed roughly in the centre of the country in which the seizure occurred. There are a number of locations with multiple seizures over the study time frame and these are coloured darker than those locations with fewer seizures. We welcomes referenced information to update the map and the dataset is available for research and analysis upon request. Please contact us. The plight of pangolins globally is at a crisis point, with populations for all eight species at risk of extinction due to unprecedented levels of illegal trade which show no sign of abating despite recent CITES uplisting. The time is now to ensure that these unique creatures continue to exist and thrive in their natural habitats and do not become yet another relic confined to the annals of museum records. We urge countries that legitimise the use of pangolin scales in medicine to amend legislation to end this practice and dispense with the claim that the source of pangolins includes captive-bred specimens, and for all consumer countries to launch demand-reduction campaigns. 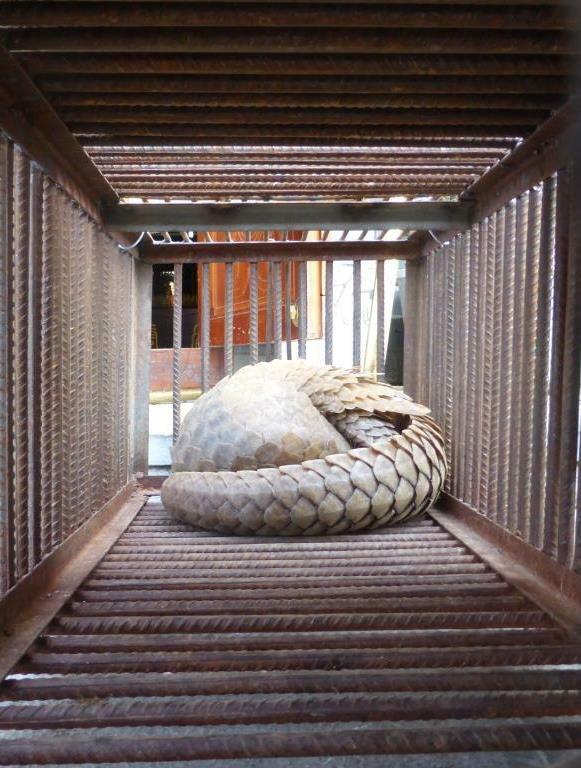 Further, we recommend that all countries with high levels of illegal trade invest in an effective enforcement and criminal justice response to wildlife crime, including increasing prosecutions and deterrent sentencing for those convicted of illegally trading in pangolins.